Elections nowadays garner a lot of excitement, and many in recent years have been called ‘the most unpredictable elections in recent times.’ Polls suggest that the results will be neck and neck, and while each party claims that their manifesto is completely different from the others, there is also a skepticism that no matter which party comes to power, things will continue to be difficult regardless. Important issues, like the environment, hardly even make any headlines, let alone receive any promises. And promises have been broken so frequently before that we wonder if there is any politician who we can really trust. So, keeping topical, we thought we would put forward what the manifesto of the Muslim world 1400 years ago would have been like. And you can decide if you would vote for it. When people decide who to vote for there are two main things they look at: the party leader and the party’s policies. Firstly, we would want the leader of any party to have credibility. They should be someone we can trust and someone who keeps their promises. During his life the Prophet Muhammad* was widely known to be honest, so much that he was nicknamed Al-Amin, meaning ‘the trustworthy one’. He always taught that people should always always keep their promises, no matter what, and his reliability was such that he used to act as something of a bank – the people of Makkah used to leave their belongings with him for safekeeping, as they knew they would be safe with him. Slightly perversely, this was a practice that continued for years, even after the very same people started persecuting him for spreading Islam – even as they accused him of lying and fabrication, they trusted him enough to turn over their most precious possessions. People often used to look to him to resolve their disputes. Nowadays we are often disillusioned by politicians for their double standards and for being privately dishonest, corrupt or hypocritical. There is always someone having shadows cast on them for an expenses scandal, an affair or for abusing their position as a leader. By contrast, the Prophet* practised what he preached and never took advantage of his position. 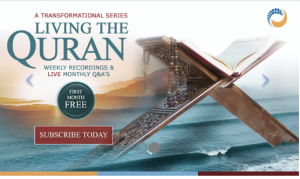 When he first started openly teaching Islam, many of the Quraysh thought all he wanted was wealth and power, which they accordingly offered him in return for his stopping preaching. He refused. Even after the conquest of Makkah, when he was the leader of the entire Arabian Peninsula, he gave away almost everything he received in charity. When parties come to power, they often find that they can’t keep their pledges because they have made deals with others to secure their moving up the ladder to get into office. It means they are restricted when they get in, often finding their hands tied when they want to make changes that would be in society’s interests. For example, even though the harms of smoking have been known for many years now, it has taken an extremely long time to ban tobacco advertising and smoking in public places, due to lobbying by the people who would stand to lose because of the ban, who have a lot of money and hence are powerful and demand to be listened to. On the other hand, the Prophet* was a man of principle, preaching Islam without compromising on his beliefs. The wealthy and powerful leaders tried to negotiate, at one time even suggesting that they would allow Islam to coexist with their religion, as long as the Prophet* would agree to alternation between practising his religion one day and their religion the next. Yet even though he was being followed by only the weak and poor at the time, he didn’t dilute his message to appease senior figures. The main points of Islam were the same when it started as they were during the conquest of Makkah, and the same as they still are today. Now onto the policies. The aim of parties’ policies is to address the problems with the society, or at least gain votes by seeming to do so! So what were the problems with the Arab society in the first century? The Quraysh took their role as guardians of the Kaaba very seriously, viewing themselves as superior to all other races and using this belief to justify abusing their role to gain wealth and status. There were warring tribes with long-held prejudices and feuds. Women had no rights and daughters were seen as worthless – it was common to bury baby girls at birth. Traders were dishonest, lying about the quality of their products and doing things like watering down their milk to make it seem like more. Islam, in comparison, promoted for equal rights for everyone. It helped women, children and the elderly, and encouraged charity and help for the poor, sick and disabled. It advocated respect for all, regardless of race, status or gender, which was one of the main reasons that most of the first converts were slaves, or from the lower classes of free society. One famous example is Bilal ibn Rabah**, an Ethiopian slave who was treated terribly by his master, Umayyah, a senior figure among the Quraysh. Bilal** converted to Islam when it was still being taught in secret from the Prophet*’s house. When Umayyah discovered this, he was outraged, and tortured Bilal** by placing heavy rocks on his chest while he lay on the burning sand, continuing to pile up more and more until Bilal** would renounce Islam and revert to polytheism. Bilal** refused, repeating ‘Ahad, ahad’ meaning ‘God is one’, and his torture continued, until he was bought and freed by Abu Bakr**, the Prophet*’s best friend and one of the few richer converts. Later, after the migration to Madinah and the construction of the first mosque, Bilal** was chosen as the first muadhin, the person who made the call to prayer five times a day, a very important role in the society. Freed slaves in Makkah under the Quraysh were still treated as second class citizens and expected to serve, so the fact that Bilal** was chosen over the Prophet*’s family and companions for this vital role shows how free from discrimination Islam’s society was. Islam also teaches tolerance towards other religions. The Prophet* and his companions lived harmoniously with the Jewish and Christian tribes in Madinah, and it was under the rule of the Muslims that Jerusalem prospered in arguably the most peaceful period of the city’s history. It was under the rule of Umar**, the second caliph, that Jerusalem was first taken over by the Muslims. Umar** came himself to receive the key to the city and was invited to pray in the Church of the Holy Sepulchre, but declined so as not to give the wrong impression and endanger the church’s status as a Christian site. It was also under Umar** that the Jewish people were allowed back into the city, after they had been kept out by the Byzantines for centuries, after which all three religions coexisted amicably until the Crusades five hundred years later. The first child benefits were also introduced by Umar**. He was once standing guard over a caravan, and during the night, he heard a baby crying. When he discovered that the reason was that the mother was unable to feed her child, he ordered that every child receive a regular stipend, a proclamation that was then implemented throughout the lands under Muslim rule. He also introduced disability benefits and pensions. Once he passed a blind Jewish beggar, who he invited back his own house. He fed him, and then took him to the treasury where he instructed that this man and others like him should be taken care of as they had paid taxes when they were young and able so should be looked after now when they were no longer. Islam also has clear rules about business ethics. Customers must not be short changed and faulty products should not be sold, or if they are the seller must be open about any defects. However, people are still encouraged to do well in business, if through only honest methods – an important thing to note is that for all its equality, Islam is not Communism. Though the Prophet* himself was illiterate, he was adamant that all the children of society should be taught. After a battle in which the Muslims had returned with many prisoners of war, the Prophet* said that if any prisoner could teach children to read and write they would be freed without having to pay a release fee, which was the normal practice. Women too were, and still are, encouraged to learn. A woman in her nineties recently died who had during her life taught Quran to many of the greatest male scholars of today. The environment is also included in Islamic principles. Muslims are taught to look after the planet and planting trees was encouraged. Animals too have specific rights. The idea of halal meat tends to be associated with the act of killing the animal, but it actually includes looking after the animal well as it grows up too – i.e. free range hens.